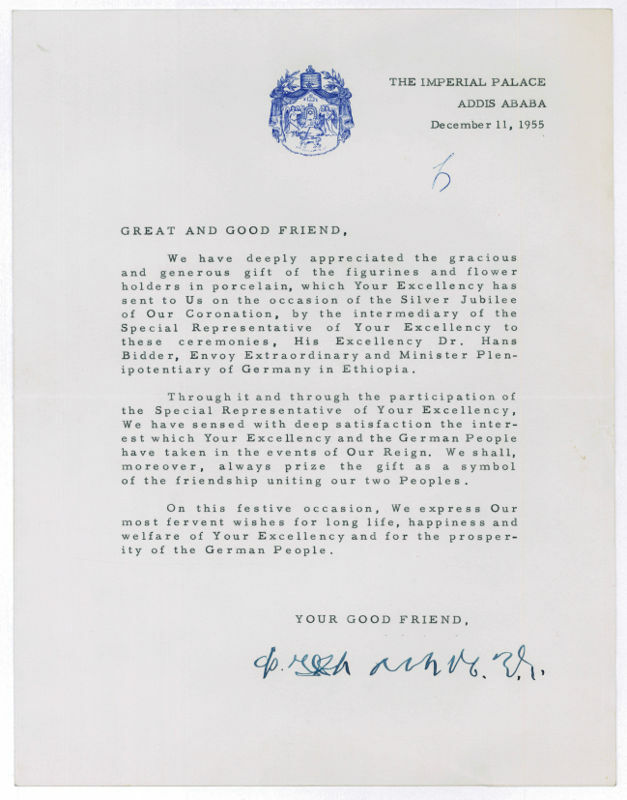 letzter Kaiser von Äthiopien (1892-1975). Typed letter signed. "The Imperial Palace, Addis Ababa". 1 S. auf Doppelblatt. Gr.-4to. Mit ms. adr. Kuvert. 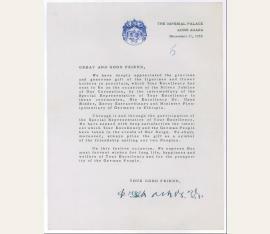 To Theodor Heuss (1884-1963), the first President of the Federal Republic of Germany: "We have deeply appreciated the gracious and generous gift of the figurines and flower holders in porcelain, which Your Excellency has sent to Us on the occasion of the Silver Jubilee of Our Coronation, by the intermediary of the Special Representitive Of Your Excellency to these ceremonies, His Excellency Dr. Hans Bidder, Envoy Extraordinary Minister Plentipotentiary of Germany in Ethiopia [...]". - In the year before, Haile Selassie I. was the first foreign head of state who paid a state visit to the then new Federal Republic of Germany. - On stationery with embossed letterhead; envelope with red seal.